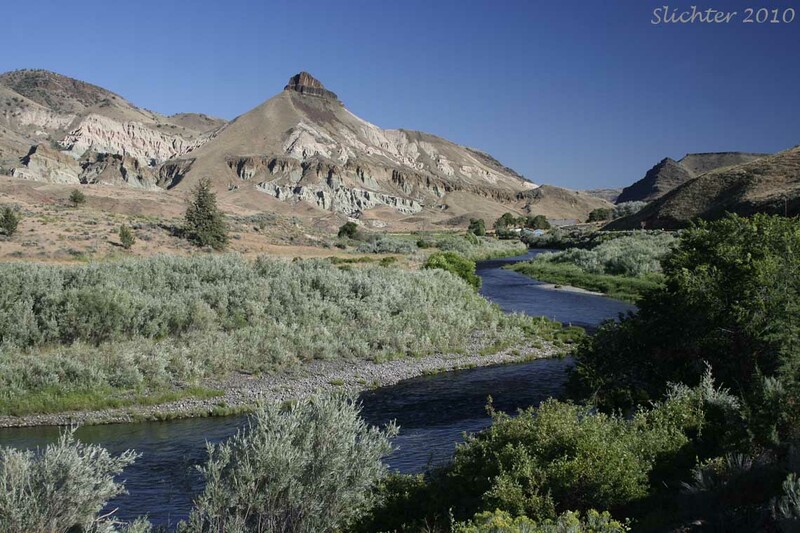 A view southeast across the John Day River towards Sheep Rock in the John Day Fossil Beds National Monument. Buildings around the James Cant Ranch House are visible in the distance. The Thomas Condon Paleontology Center (although not visible here) is located on the west side of Oregon Highway 19 from the James Cant Ranch House. Photographed on July 18, 2010. While travelling to the Strawberry Mountain Wilderness and upper John Day River country, there are numerous places to stop and explore. Many of the trips suggested below involve just short walks along the highway (a chance to stretch your legs and back!) while others are hikes which might take more time. Additional Hikes and Trips in the Malheur National Forest - The hikes and car trips within this link are highly suggested for those who plan to spend a couple of extra days here, whether you camp in the forest or whether you make hotel arrangements for before or after the meeting dates. Oregon Highway 19 (Condon, OR to the junction with US Highway 26 at Picture Gorge) - This is a 5 hour drive from Portland to John Day with only a few short stops. Add up to another hour to drive to Lake Creek Camp in the Logan Valley. Traffic is generally light on this scenic highway. Much of the highway east of Service Creek was recently paved so it should be good quality. A bridge was being rebuilt about 10-15 minutes north of the Thomas Condon Paleontology Center in 2010. I don't know if that will continue into 2011, but there generally were no delays there during the past season. This is a good route to keep an eye on the roadside vegetation and make stops as something interesting is seen. (Oregon Highway 19 Roadside Plant List]. b) Shelton State Wayside - Located 10 miles SE of Fossil, OR along Oregon Highway 19. 36 primitive camping sites with water and vault toilet. There is a 2 mile nature trail through ponderosa pine forest. There are numerous spots along Oregon 19 to stop along the highway to view wildflowers. Traffic is light here but be sure to get safely off the highway. An interesting side trip (or route) from the Shelton State Wayside is to take the Rowe Creek Road which turns sharply west then heads south from Highway 19 (a mile or two north of Shelton State Wayside) to Twickenham. From there, one can drive west on the dusty Twickenham Bridge Creek Road which is the back road into the Painted Hills, or continue driving south heading uphill on the Girds Creek Road where at its end you can turn right and drive the high country southwest to Mitchell, OR, or head downhill to the east back to Highway 19 at Service Creek. US Highway 395 (Pendleton, OR to John Day, OR) - About a 2 hour drive from Pendleton to John Day. Add up to another hour to drive to Lake Creek Camp in the Logan Valley. a) Battle Mountain Forest State Scenic Corridor (Oregon State Parks) - I've heard there are good wildflowers along some of the hikes here, including some nice spring to early summer native bulbs, but have only been by here in the middle of the night so I don't know more than that. Can anyone else send me any specific information? b) Ukiah-Dale Forest State Scenic Corridor: I often camp at this campground when in the area. Search for wildflowers (and birds) around the perimeter of the campground as well as along the creek to the east of the campground. I also carefully walk the west side of Highway 395 north from the entrance of the campground. This is good spot to find round-leaved trillium (Trillium petiolatum) in bloom around Memorial Day most years. d) Bridge Creek State Wildlife Area: I've wanted to visit this area, partly for the animal viewing, but also to start a plant list. Unfortunately I haven't been here yet so I can't vouch for how good it will be. Still, I'll get there some day! Harney County Road #127, USFS Rds #43 and #47 and Grant County #68 (Provides alternate access between Burns and John Day, OR) - Depending on the number and lengths of stops, this could be a full day drive.